The largest military airshow in the world, the Royal International Air Tattoo 2006, was held at RAF Fairford during the second weekend of July (15th and 16th of July). The RIAT is supporting the work of the Royal Air Force Charitable Trust. This years themes: Rapid Global Effect - It's a speed thing and Army Aviation. Beside of that, it was the 70th anniversary of the Spifire and a goodbye for the Canberra. The airshow was blessed with fantastic weather; blue skies every day! Perfect for an airshow. Remark: The arrivals, the airshow (both days) and the departures are splitted into three seperate pages. The photographs on this page are made on the Saturday and Sunday. If you are grateful and you want to express that, you can send a postcard or flowers. But not the Pakistan Goverment. 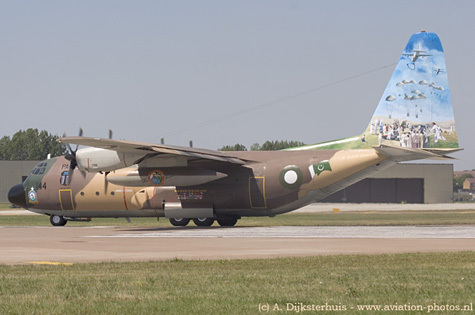 A Pakistan Air Force L.382B Hercules (serial 4144) from 6 Squadron received a special livery on both sides of the tail and flew from their home base Chaklala to RAF Fairford. Pakistan participated to say 'thank you' to all the countries that offered humanitarian aid to the victims after the earthquake in 2005. It took seven days to fly from their homebase RMAF Kuala Lumpur-Subang in Malaysia to RAF Fairford. 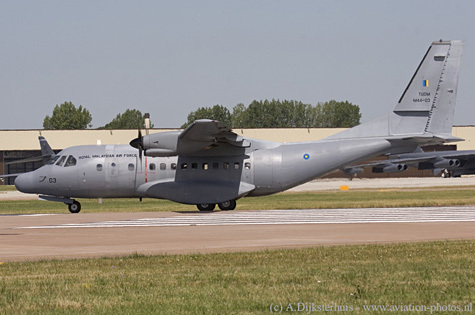 Royal Malaysian Air Force CN.235M-220M with serial M44-03 which is assigned to 21 Skn is seen here lining up on the runway for a long journey back to Malaysia. 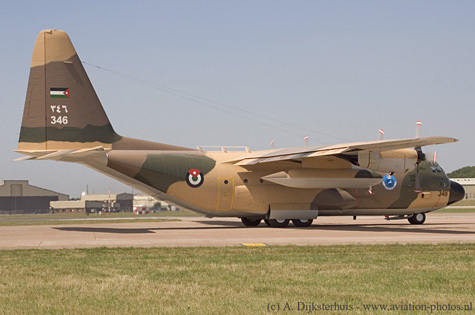 Royal Jordanian Air Force C-130H Hercules with serial 346 was parked on static display and is seen here taxiing tot the runway. This aircraft is based at King Abdullah Air Base and assigned to 3 Squadron. 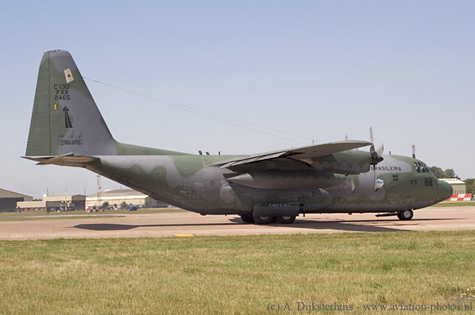 Another highlight at RAF Fairford was this Brazilian Air Force C-130 Hercules with serial 2465. 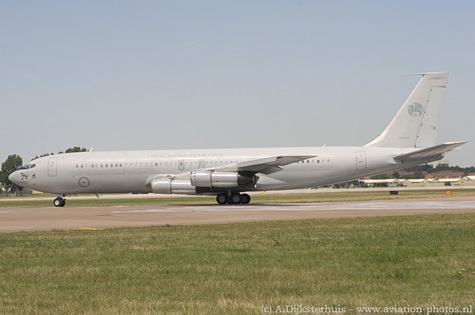 The crew of this Royal Australian Air Force B707-368C with serial A20-621 travelled more miles than any other participant. They surely didn't complain about that if you compare their flight with the journey that the Malaysian crew made. 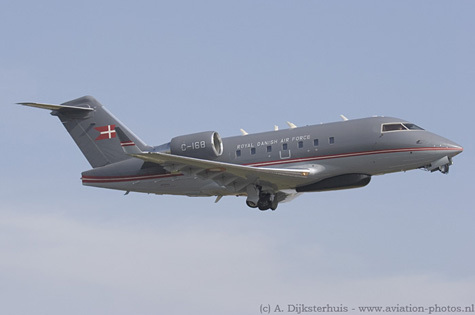 Various support and VIP aircraft visited RAF Fairford; a Royal Danish Air Force Challenger (serial C-168) is seen here departing on the sunday. 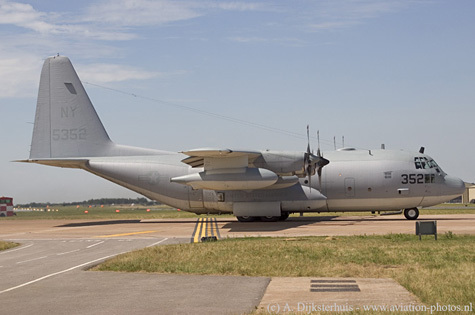 An United States Marines Corps KC-130T based at Stewart Field (New Jersey) with serial 165352/NY-352 is seen here taxiing to the runway at RAF Fairford. 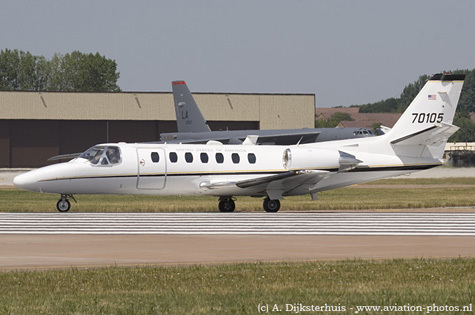 An United States Army in Europe UC-35A1, serial 97-0105, from the B Company 1-214th AVN which is based at Wiesbaden (Germany) is seen here a few moments before take off. 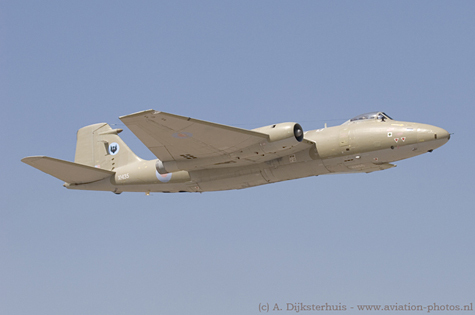 Between 1958 and 1962, 23 production standard Canberra PR9's were build under licence by Short Brothers. Three of them were still operational with 39 (1 PRU - Photographic Reconnaissance Unit) Squadron during the 2006 edition of the RIAT. A couple of weeks later, the Canberra's were retired after a long and impressive career within the RAF. Canberra PR9, XH135, is seen here in take off. 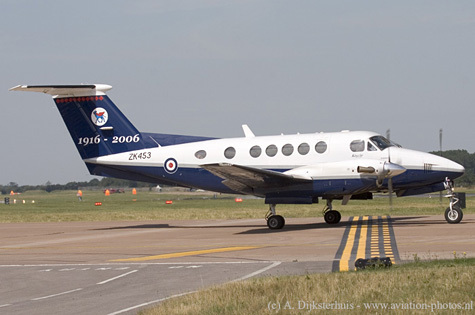 A RAF Cranwell based Beech King Air 200, serial ZK453/M, is seen here with special markings on the tail, celabrating the 90th anniversary of 45(R) Squadron. 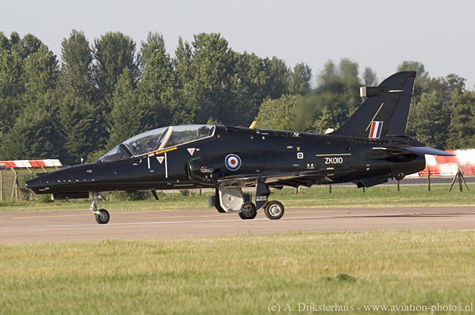 The BAE Systems Hawk 128 was selected for the Royal Air Force and Royal Navy as the new Advanced Trainer Jet, replacing the Hawk T.1. One example of the Hawk 128 (with serial ZK010) was present at RAF Fairford and is seen here making a turn on the runway. 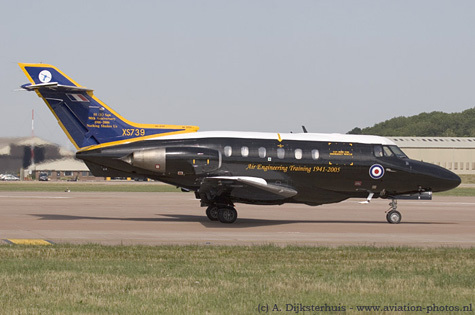 One of the few aircraft wearing a special livery at RAF Fairford was this Royal Air Force Dominie T.1 with serial XS739. This Dominie is assigned to 55 (R) Squadron. Reason for this special livery was the 90th anniversary (1916-2006). 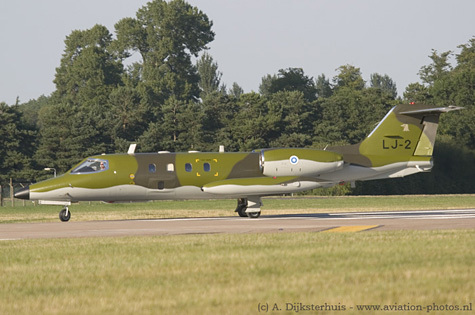 This Finnish Air Force Learjet left RAF Fairford quite early, the LJ-2 is seen here taxiing to the runway on the Saturday. Two Hellenic Air Force A-7E Corsairs arrived at RAF Fairford, both were parked on static display. 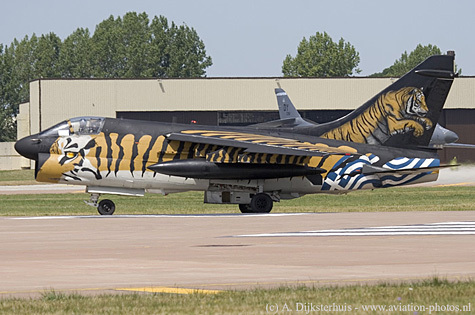 One of them, A-7E with serial 158825 is seen here wearing a lovely tiger livery. Two Turkish Air Force F-4E Phantoms were parked on static display. One of them, F-4E with serial 68-9342, is seen here entering the runway. 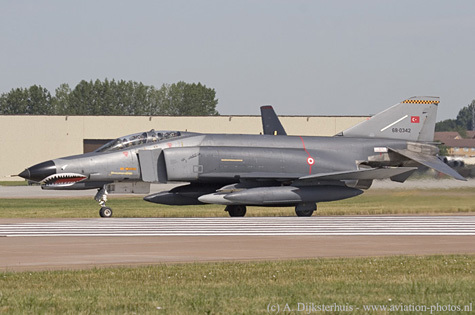 The 'good old' Phantoms came from Malatya-Erhaç and are assigned to 172 Filo.